As many of you know I live with a disease called MS. Today I am feeling my MS as I struggle with a sinus infection - it seems as though I can't get sick like "normal" people....when I get sick it always goes straight to a full fledge infection. Last night I was so sick I was delirous - I think Joel was a bit annoyed or ammused! Anyway - let me get to the point. There is five kinds of MS - I have the relapsing remitting form. Some forms are more serious some are less. Mine is considered moderate - for that I am thankful, however that could change anyday and for that I must be prepared. I am writing this email not to let you know about my MS - but to help educate the people around me. I have another dear friend who is a few years younger than me and has been suffering with this disease for several years longer than I. She struggles at times to walk, she is not able to work, her life has been completely altered by this debilitating disease. Although with many people that have this disease - you can't tell by looking at her. She looks just like any other trendy 30 year old - hence why this disease is called the invisible disease. Today my friend made a bumper sticker - that is pictured below. My friend has been given dirty looks, received rude comments, and finger pointing when she gets out of her car that she parked in the handicapped spot. If she had to park far away from the store - she wouldn't make it back to the car - you see if we can conserve our energy - we can last longer each day. It is not just fatigue - it is like your body is a sand bag. I hurt for my friend who has received such looks and comments from people who have no idea. I guess my point is this - we need to stop judging people on their appearance - because by just judging on the outward appearance we are going to fall short every time. But the other thing that I am learning from this is that I need to educate people. So pass this on - tell other people - and next time you see someone pull into that handicapped parking spot - be slow to judge and quick to assist - you have no idea what that person may be struggling with day in and day out! This my friends is one of the reasons that I dread the day I have to get my handicap placard - because I don't want to be judged - sad isn't it - so many people that could benefit from the closer parking will never take that step for fear of what people will say or assume! Lent is a time when we often talk about giving up things to consider the sacrifice that Jesus made for us on the cross. I often give things up, but over the past few years I have tried to be very intentional about making a commitment through lent to do something that will draw me closer to Christ. One year I gave up dating - to seek God's heart (and it got me an amazing husband, thanks God!) one year I did a prayer journal throughout lent, another read my Bible daily through lent. Well this year, in conjuction with Blood Water Mission I am going to do Forty Days of Water. One of the things that Jesus asks of us as Christians is to reach out and share with the least of these....after spending a month in Africa - I found that the people there may be considered the least of these as far as their physical situation, but they showed me that Spiritually I may at times be the least of these....they were so grateful, so grounded on Christ, so dependant on Him...boy did I have so much to learn! If you would like to join me on this venture - drop me a line so we can help each other remain accountable. 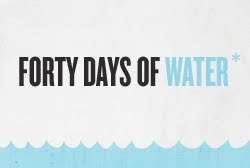 If you can't join us in the Forty Days of Water - consider making a donation to Blood Water Missions! So it has been about a month and a half since Joel and I began our healthy living program! We started with the Atkins diet for the first four weeks. Joel is still doing the Atkins much more strickly than myself, however I have altered the diet a bit more. I am glad I did the Atkins to start because I really needed to detox my body from all the carbs and the sugars! It was so hard - I was having some strong cravings! I am so thankful that Joel was doing it with me - it not I am sure I would have cheated! So what am I doing now? Well I am doing a little of this and a little of that! Actually I have been doing a lot of label reading on my last few trips to the grocery store - my last trip was not quite as long since I am starting to really know my foods. I have also done some research into the Belly Fat Diet - that diet focuses on cutting down on your sugars - and limiting your carbs to six servings which I am doing! The biggest challenge is that you are supposed to limit your sugar to 15 grams a day. Did you know a banana has 18 grams of sugar - yogurt has 32 grams of sugar - and those are considered diet friendly foods - wow! I read that the average American Woman eats over 435 grams of sugar a day. While I think 15 is a bit extreme - I know I need to cut back. So now to what I am doing....I am being aware of my carb intake - I am not cutting them out completely but I am trying to stay under the 6 servings a day. I am eating food that is high in fiber - because to figure out net carbs you subtract your fiber from carbs to get your net. Reading labels was time consuming at first but now I know which foods are high in carbs and which are not. The biggest surprise is how much sugar is in food! I am still doing some label reading in this area - but I think it is really making a difference. I have also found Truvia which is a natural sweetener from the Stevia plant - it is so much better for you than Aspertame or Splenda (and they sell it at the Village Merchants in Richfield). My goal is to stay under 50 grams of sugar a day. You may be wondering the results - well I have lost about 12 pounds so far - if I was more strict I am sure that I would lose more, but I am happy so far with the results - if I could add a little exercise to my routine I would do even better. Joel has done really well also - about 20 -25 lbs lost! So thanks for following me and thanks for your words of encouragment. My goal is to lose 20 more by June! I can do this without going crazy!